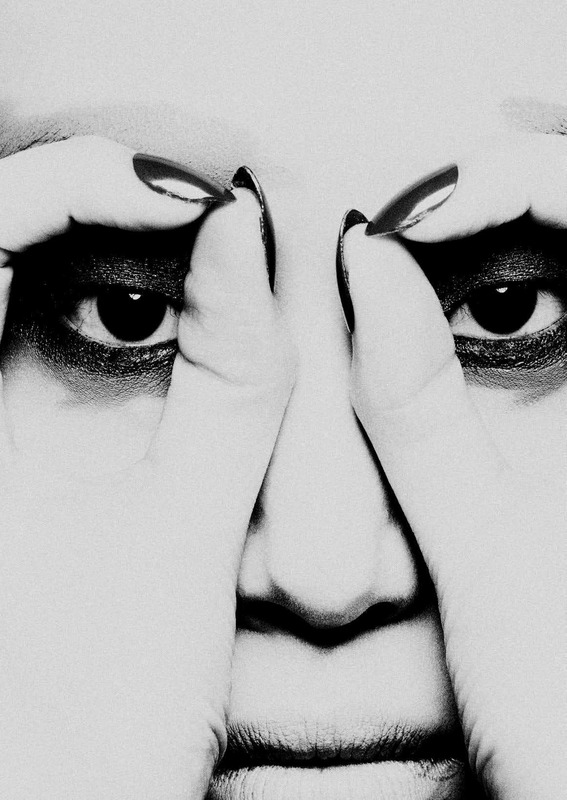 Photographer: Ben Hassett. Model(s): Sora Choi. Source: Vogue Japan. Stylist: Nicola Knels. Makeup: Marla Belt. Hair: Joey George. 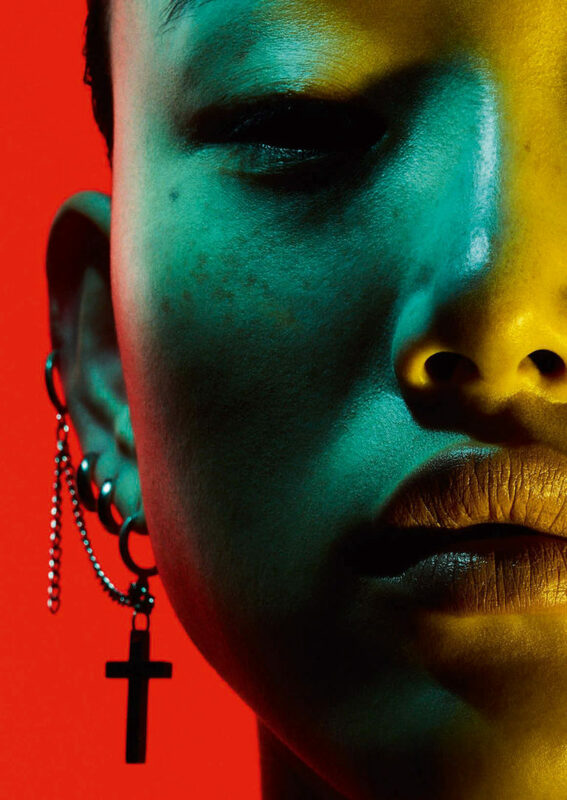 Sora Choi engages in a game of facial fantasy in “Play it Loud” shot by Ben Hassett for Vogue Japan, March 2018. Drama is displayed in a variety of ways, exposed in the pageantry of passion. Artistry echos in the background leaving moody elements of anarchy to ache from below. What we see isn’t the whole picture, as the body delights in secrets being dictated from beneath. 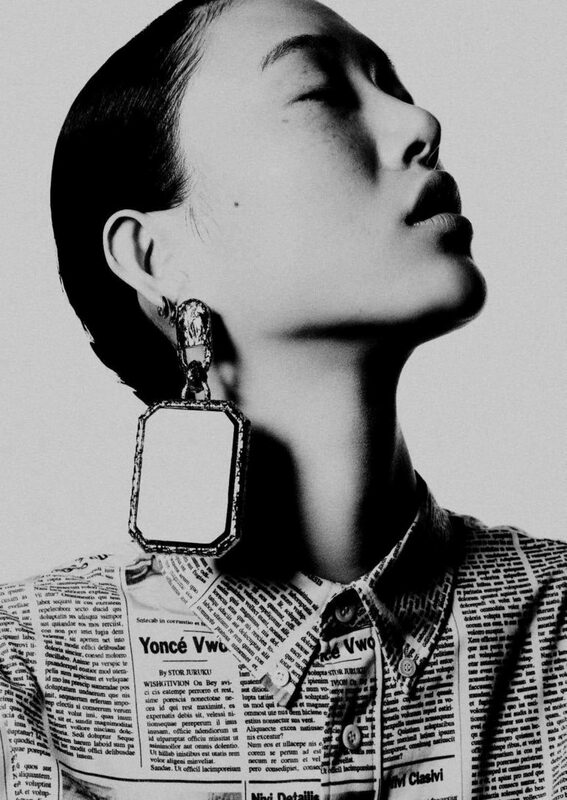 Nicola Knels keeps things focused as only two shots show any form of high fashion. One, in black and white, has Sora in a button-down shirt covered in pages from a newspaper column. Following the same theme, fashion goes to the funnies, as she’s draped in a comic couture scene. 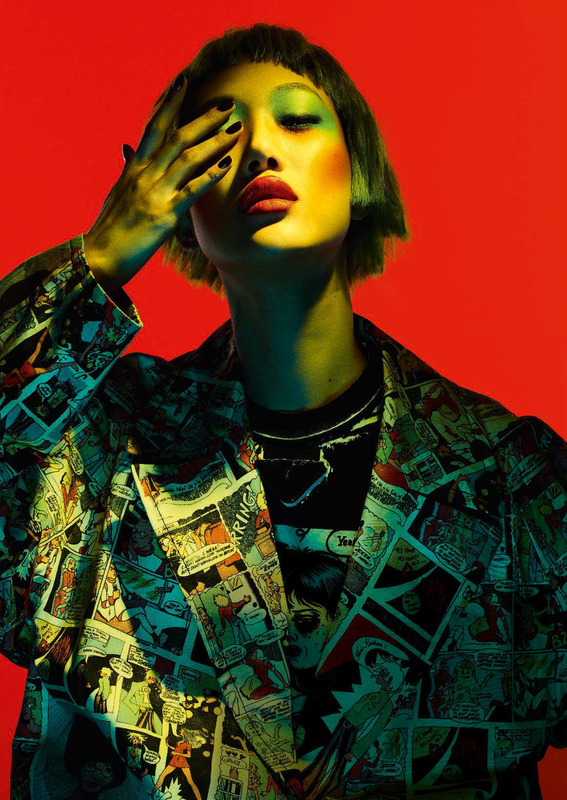 Hassett projects a sense of cinematic celebration, from comics to editorial copy, this fast-paced editorial involves a level of visual play. The music of makeup is heard, as Marla Belt blends the purity of beauty with the artistry of excess. Playing a game of up close & personal defies our sense of space as this photography first gets in your face. Expressions are the manifestation of raw emotion. Sentiment is expressed through simple but powerful facial affectation. Symbolic movements evoke a passionate response, as vivid intentions are met. Her features are broken up, giving us a look into the spirit of the skin. 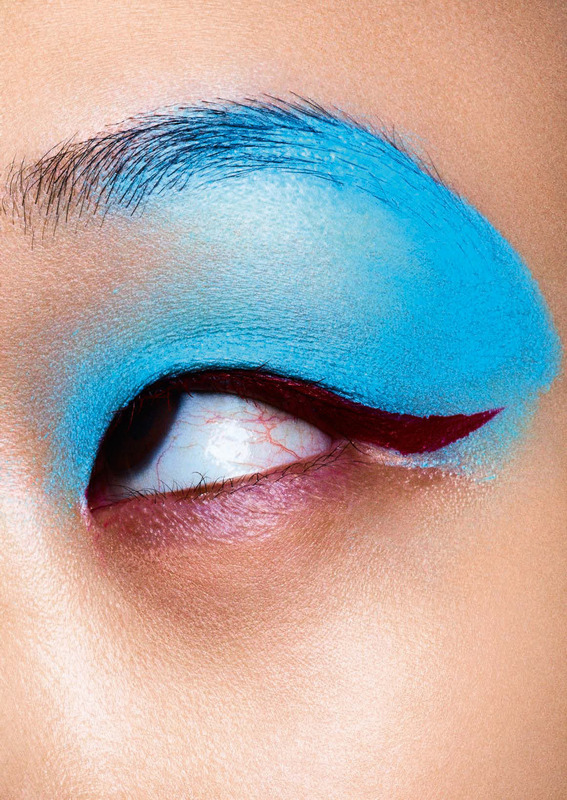 Black creates a winged line that flies out the eye’s side, as blue cascades over the lid, crashing into the tail of the brow. 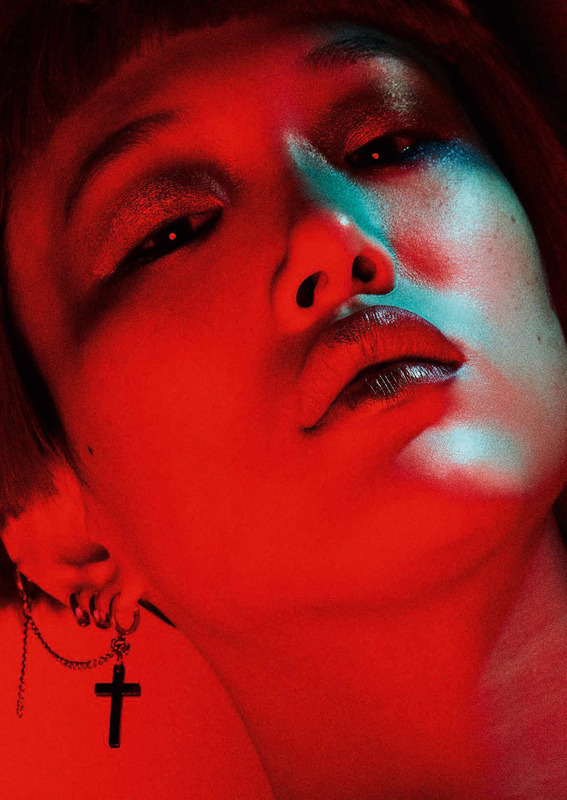 A red light blasts the background giving a scarlet glow, as Choi’s skin evolves from a naked face with freckles to a masque of pure perfection. Blush rushes up the cheeks meeting the mint green eyeshadow, as the scarlet mouth matches the room’s decor. Lips are kissed with bright red hue as her tongue lingers as it licks. Joey George gives her a sassy dew that’s back in black and down in shades of silver. Edgy and terminally chic, Marla’s magnificent makeup style is dynamically distinct. The silence of secrecy doesn’t allow us to see… drowning in discernment aching to be free… there lives a kind of chaos that flows from you to me… waiting for our love to pour into eternity. In the tundra of tectonic turns there lives a kind of vacuum. It forever hides inside our mind making us who we are… changing it would be akin to catching a shooting star. We aim to meet our soul retreat… a sanctuary from our sins. A strange delight… shifts in sight… turning away to catch the falling light.